This is a 1/20-scale model, so an average person would be just under 3-1/2” tall. The 12” long model is made mostly from Japanese cedar, or Sugi, with beams and rails made from Hinoki, or Japanese cypress. Those interested in Japanese style boats should check out the website of American boatbuilder Douglas Brooks, who has studied in Japan and apprenticed with five traditional Japanese boat builders and has written articles and one book on the subject. Tabune, or rice field boats, are most commonly nothing more than tubs, built like a simple wooden boat, that field workers would used to carry things through the flooded rice fields. This larger rice field boat was used where fields were connected by canals or rivers. 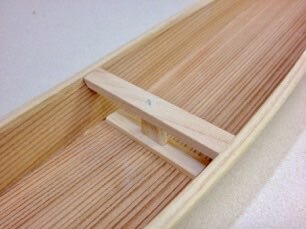 While communicating with American Boat Builder Douglas Brooks about his research on Japanese boats, I noticed that he had posted some photos on his blog from his time in Gifu prefecture where he was studying construction of a another boat type. The photos included this large Tabune and a good photo of a drawing plan used to build it. Realizing that the plan photo was pretty clear, I spent some time studying it to see if it was something I could build easily from scratch. 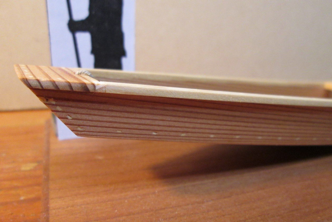 Having started other scratch projects of Japanese boats, I was anxious to complete one. A Tabune is a rice field boats used to carry things while working in the flooded rice fields. 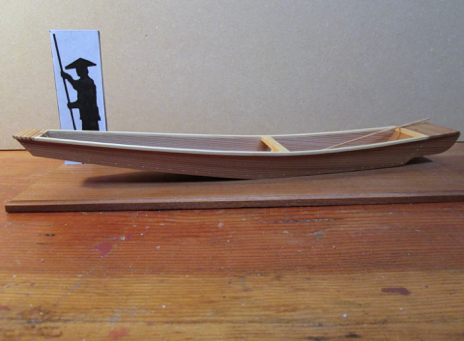 This 1/20-scale model is based on a type of boat found in Gifu prefecture in central Japan. 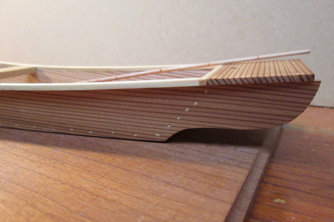 The model measures roughly 12” long, 2” high, and 3” wide, and is made primarily of sugi, or Japanese cedar.